Hope your week is off to a great start! The weather has been crazy lately! It was almost 70 degrees this weekend and today we are supposed to get snow! Good thing I pulled out this coat last week! This coat was a birthday gift last year! 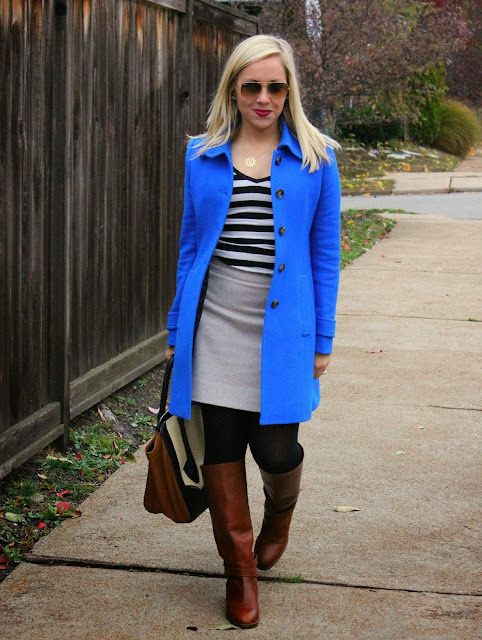 I love the blue with my neutral outfit! I have a ton of coats! By that, I men I have one in almost every color! Coats are my favorite, and I partly blame my mom! She is the exact same way! Thank goodness we wear the same size! I love that coat! It doesn't get cold enough where I currently live (South Florida) but I would definitely get something like this if it did! I did just buy a cobalt skirt at J Crew Factory and can't wait to wear it. Thanks Tracy! This color blue is always fun! This is such a fab blue coat Jacqueline!! Stunning colors and so pretty!! You look gorgeous! 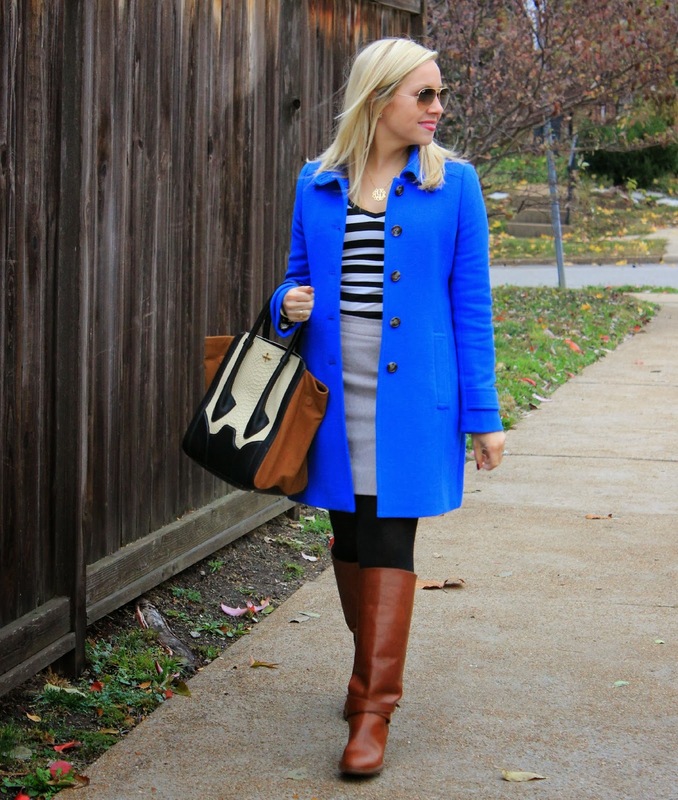 I love the cobalt coat! I need to get a fun, brightly colored coat for this winter. 70 degrees, then snow? That's IL weather for ya! Lol. So bazaar. That coat is such a pretty color-- love it! I agree! The weather is crazy cold today! Gorgeous blue coat. You look pretty amazing. Love the coat in bright blue! It'll make you feel good to put that on when we have dreary cold snowy days! I agree! This was worn last week on a cold and cloudy day! I wore it today, because it was freezing! Sooooo cold here in KC right now, too! A few days of this, and then it's supposed to bounce back up into the 50s. But this weather has made me realized I'm SO not ready for winter, haha. Lovely coat, doll. Cobalt is your color! I agree! I was freezing this morning! I hate chipping the ice off my car at 6 AM. Not fun! That blue coat is so pretty! Definitely eye-catching! 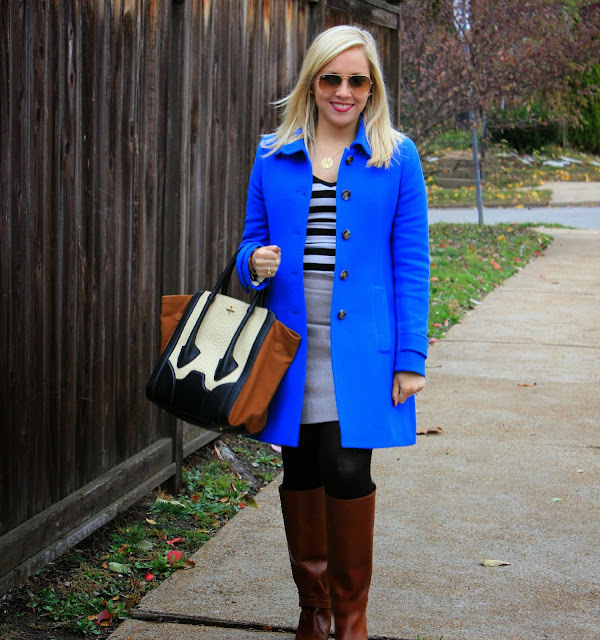 I love bright coats! Cobalt is a gorgeous color on you. You look fabulous! I walked out of my house this morning and it was a good 20 degrees colder than yesterday. I guess I better pull out my coats too! Thanks Nikki! Bright coats are so fun! The one color I do not have is black! Crazy! Thanks Katie! Hopefully you will get some of the cold we had today! I just bought a pink coat just like your blue one! 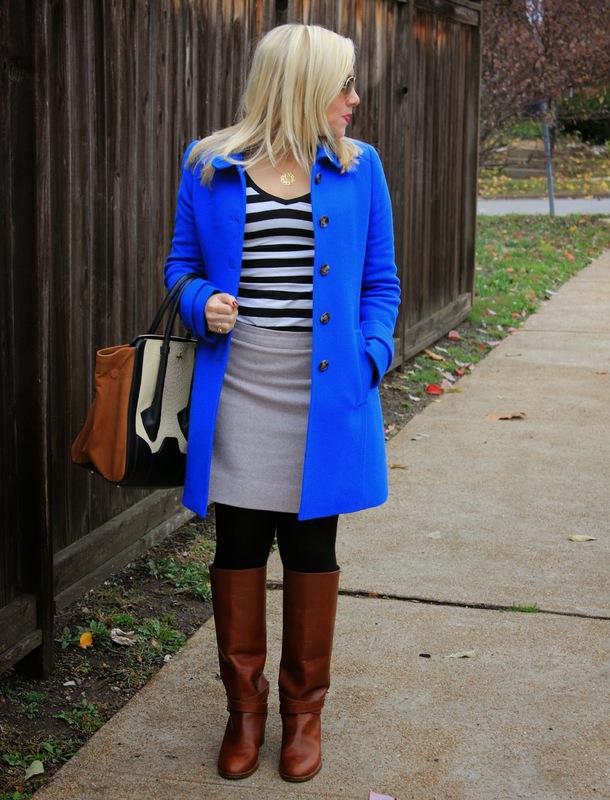 I am loving these bright colors in the winter time! Me too! I have a tone of bright colored coats! I love color so much, I do not own a black coat! Thanks Vicki! I love choosing coats! I have a ton! Kinda my obsession for winter! I love all of them! Oh I adore that jacket, especially the color. Its gorgeous and you look great. Wow! The blue is gorgeous on you!